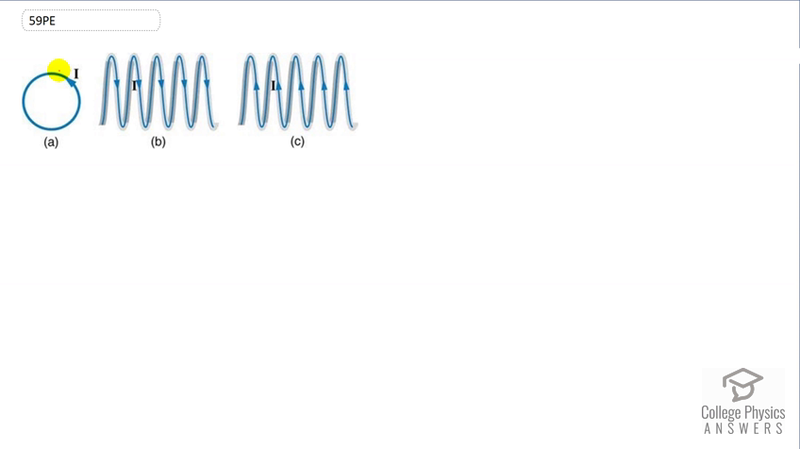 What are the directions of the fields in the center of the loop and coils shown in Figure 22.66? Figure 22.66 Loops with currents. This is College Physics Answers with Shaun Dychko. We’re going to find the field direction by using the right hand rule. So we’ll grab this loop of wire with our right hand and have our thumb point in the direction of the current, and when you put your fingers in the middle of the loop, you find that they are sticking out of the page, and so all the field lines are like a dot on the tip of an arrow coming out of the page towards you. And outside the loop, the field lines are going into the page but the question is asking us what are the field lines direction in the center of the loop. So the answer is coming out of the page in the center of the loop in part a. In part b, it’s actually a little hard to understand how this, like which side of the loops that are drawn here are closer to us. I think from here, it looks like this is going away so this is the side of the loop close to us and this is the side far from us. So when we grab the wire, we’ll grab the front part of the loop with our right hand and our thumb is going to point down in the direction of the current, and in the middle of the loop, our fingers will be pointing to the right so the field lines are going to the right through this solenoid. And in part c, if we grab the part of the loop that are close to us, our thumb would be pointing in the upwards direction now, and the fingers in the center of the loop would be pointing to the left. And so part c is to the left.